Catharina Karl was born on 20 February 1865 in Hessen. She was baptized/christened on 26 February 1865 in Freimersheim, Rheinhessen, in der katholischen Kirche. According to the various censuses, Kate immigrated in 1883 or 1884. There appear to be two possibilities: Catharina Karl, age 18, servant, arrived in the Port of New York on 21 September 1883 aboard the SS Main from Bremen, apparently traveling alone, in steerage class. 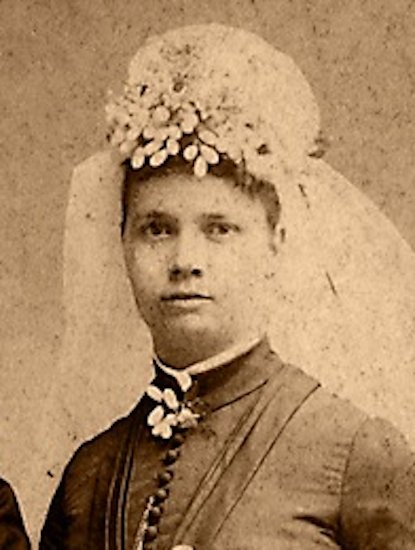 Although it is possible, but quite unlikely, that she returned to Germany and arrived again in the US in 1884, there was a Catharina Karl, age 19, who arrived in the Port of New York on 2 August 1884 aboard the SS Fulda from Bremen, traveling in steerage compartment B with 18?-year-old Peter Karl. She married Johann Georg Surber, son of Johann Georg Surber and Maria Barbara Burkhardt, on 11 July 1889 in Manhattan, New York, at St. Luke's Evangelical Lutheran Church, West 42nd Street, with Pastor Georg F. W. Busse officiating. The marriage was witnessed by Jacob Karl and Linus Molz. Heirloom linen towels bearing the monogram "K" belonged to Catharina "Katie" Karl. The linen was found in the home of Rose M. (Jaeger) Surber, wife of George Louis Surber, after her death. She was a bakery saleswoman, likely in the family bakery. Catharina Karl became a widow at the 12 July 1936 death of her husband Johann Georg Surber. Catharina Karl died in April 1951 at age 86 in Bronx, New York, at 995 Summit Avenue. She was interred on 24 April 1951 at All Faiths Cemetery, Middle Village, Queens County, New York.